From the creators of Worldly Galaxies and RandomPack comes Arisen, a kitchen-sink modpack for Minecraft 1.10.2 that aims to showcase the best mods on the Curse client! Arisen Experimental showcases a ton of underappreciated mods such as Advanced Combat, Morph-o-Tool, and much more! This pack can be used on servers as well. ARISEN 4: REBIRTH is the fully released, stable version of Arisen Experimental. It has been fully tested on both singleplayer worlds and servers to make sure as many bugs are fleshed out as possible. 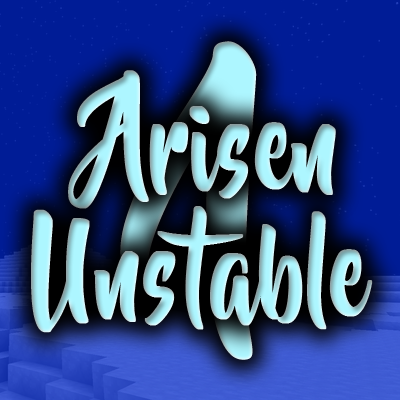 Info about Arisen 4 can be found here: http://minecraft.curseforge.com/projects/arisen-4-rebirth. This pack is in a Beta state, so please do not download unless you want to help the development of the official release go even quicker. This pack will be filled with bugs, be laggier than normal at some points, and require frequent world resets. BUT, if you download and help out with development, we can finish this pack even quicker! EnderIO is burning to the ground everytime. Give me until next week. I took a break from pack dev (as you can tell), and I'll be getting back into it next week. I'll update that mod when I get back to it. Make sure you have updated CurseVoice. There is a bug within CurseVoice (well was) that prevented 1.10 w/ mods from starting because Curse's API saw 1.10 as an "ancient" version of Minecraft. That is what kept this pack from being released on Forge's release day. Edit: Turns out this may be a problem with my Minecraft install, rather than on your end. Nevermind! For some reason, whenever I right-click a vanilla furnace, the item in my hand is automatically inserted and the items in the output slot are ejected onto the ground nearby. Any idea which mod causes this behavior? New 1.10 feature! Go into controls and disable the Auto Jump feature.